The Geographic & Reporting Information Database is summarised as an easy-to-use, online GIS for Natural Resource Management (NRM) groups. It is a product that Gaia Resources developed initially for South West Catchments Council, which has since grown to become a product that we have implemented for several clients, with more on the way. GRID is built on open source platforms, including PostGIS, Django, Geoserver and OpenLayers (and a few others). The underlying GRID codebase is not yet open source, but it is freely available under agreement from SWCC, under the proviso that any general changes are submitted back to the central code base for all to benefit from. Gaia Resources provides the technical support to install the system and get it running for interested parties under commercial arrangements. You can also find out more about GRID by reading our blog entries that are tagged with the GRID tag (click here). 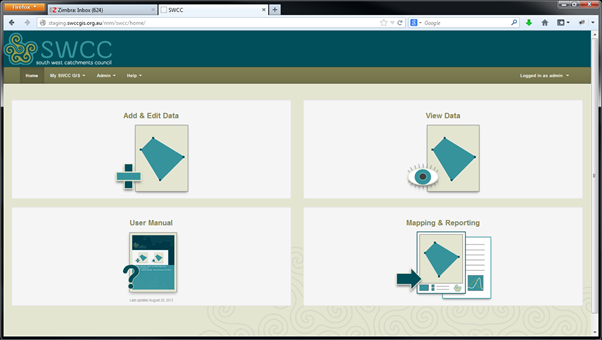 For the NRM staff member, it runs in a web browser, and lets them add and edit spatial data, view and enquire about spatial data, and produce hardcopy maps and other reports from the system. Most NRM staff use the system when they return from the field, to quickly record the on-ground activities that they have done during the day. For NRM project managers, the system provides means for them to report on work being done on their projects. The system allows for visual inspection of on-ground works, and provides mechanisms for reporting. This reporting can be amended to fit your particular reporting requirements, ranging from internal reports to management to Monitoring, Evaluation, Reporting and Improvement format reports. GRID also allows the NRM to have an Administrator appointed – this person can amend Activities, add and remove Base Layers and even add and remove users, all through an intuitive user interface. This provides the means for the NRM to become self-sufficient in managing GRID should they want to. State NRM program – who are using it for management of their grants programs. These groups are shown in the map below, with their HQs (green) and areas they cover (brown). Once this is done, our team will implement the software, test it with your staff and then go live with the production version. We also provide training as part of the standard package for an implementation. We can also host GRID in our data centre, and can provide ongoing support for staff in GRID and more generally with GIS support for your organisation. Contact our team and we’ll discuss how we can help you get started.